Our mild steel chequer plate ducting is available in thickness 3mm to 12mm. Also known as ‘durbar’ plate ducting, the raised pattern on this steel is an important part of the product. 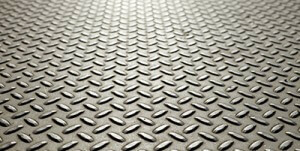 The extra strength that chequer plate steel offers makes it ideal for use in industrial environments. The raised pattern on the metal helps prevent corrosion on the steel. This is why we recommend this ducting for areas that may be subject to tougher conditions, such as industrial environments. Removable flush floor covers provide service access to the duct, perfect for maintenance purposes. Here at Screeduct® we offer a bespoke trunking service, meaning the ducting can match your exact size requirements. We use the best production techniques and patented flange fittings, which remove the need for mechanical fixings to the screed. We can also offer internal partitions for the ducting using clips and dividers. If you would like to find out more information about our mild steel chequer plate ducting, please do not hesitate to get in touch. Please also be sure to browse our online project portfolio to find out about our past completed projects.